(A) Assume that the RIR in the US falls to 3.75%. 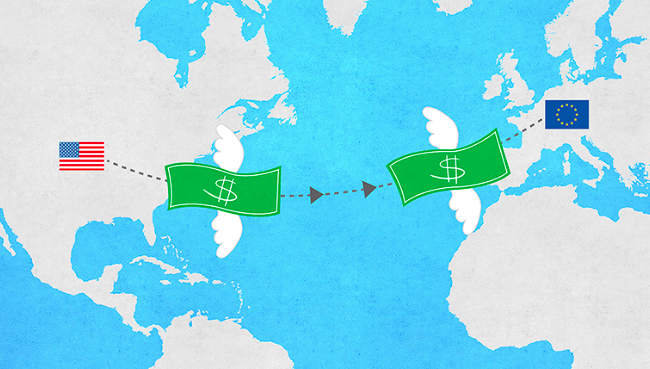 (i) How will the flow of financial capital between the US and the EU be affected? Explain. If the US RIR falls to 3.75% then international investors will move their money from the US to the EU. Why? Because they want profit, they want to make more money on their savings. So if you invested 1,000,000 and earned an extra .75% for 10 years that is close to 80,000 dollars. People move their money for all kinds of reasons but profit is a big reason. (ii) Using a CLG of the FOREX for the (EURO), show how the value of the euro would change relative to the US dollar in a flexible exchange rate system. Value of the Euro € will appreciate from V1 to V2. 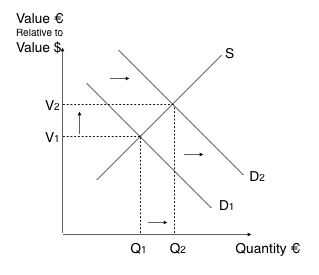 (B) Explain how the change in the value of the euro in part (a)(ii) would affect the EU's net exports. According to (A) the value of the € is appreciating or getting stronger. This means that it will take more US $ to buy a Euro €. The price of Euros is increasing, which means that the prices of Euro goods is increasing. If the EU's goods prices are increasing relative to the US goods then US citizens will stop buying as much expensive EU goods and start buying more relatively cheaper US goods. So, EU exports will decline as their currency € gets stronger and becomes more expensive, but they will with their stronger € import more US goods. The EU net exports will decline. Crash Course does a good job of painting this picture. 1950 propaganda cartoon (via ChinaSmack). The caption in the right panel reads, Now currency has stable rates, gold and greenbacks are disgraced, Renminbi are widely trusted, speculators have been busted.